Explore Downtown Rutland and experience our attractions like the Paramount Theatre, Wonderfeet Kids’ Museum, Salt Cave, and so much more! Downtown Rutland is home to several unique experiences for all interests, ages and abilities. We are home to the state's largest year-round farmers market, a brilliantly restored 1912 Paramount Theatre, incredible public art installations, an engaging children's museum and more. You may notice that many of our buildings are listed on the National Register of Historic Places due to the area's designation as the Rutland Downtown Historic District. Downtown Rutland is also close to several indoor and outdoor recreational areas including the Long Trail, Killington and Pico Mountains, Pine Hill Park, and Castleton Arena and Giorgetti Arena. Everything from local fresh produce, breads, pastries, cheese, jarred products, wine & spirits, and maple syrup to jewelry, knits, crafts and beauty products. Interactive exhibits & events dedicated to the lifetime love of learning & discovery for children. Also known as the Playhouse Theatre of Rutland, the Paramount hosts national and world-renowned performances in a Victorian-era opera house setting. Enjoy a unique salt cave experience, guided meditations, sound and light rooms, massage and reiki, and more. Enjoy a walking tour of murals, galleries and sculptures from local and international artists that contributes to our vibrant downtown culture. Sample handcrafted brews born right here in Rutland with locally-sourced food and a wood-fired pizza oven. Only two miles from Downtown Rutland, Pine Hill Park offers 16 miles of trails spread over 325 acres of terrain and offers some of the best mountain biking, trail running, hiking, walking, snowshoeing, and geocaching in the central Vermont region. With 155 trails, 21 lifts, and 1,509 acres extending across six interconnected mountain peaks, Killington is the largest ski and snowboard resort in the East and is just 20 minutes from Rutland. Also located in the town of Killington is Pico Mountain, one of Vermont's first commercial ski resorts. Pico offers 57 trails and 7 lifts with a 1,967-foot drop. The marsh is the perfect place for quiet recreation and contemplation, boasting some of the best bird watching in the state of Vermont with 136 unique species identified the area. Offering 5 playgrounds, 10 public parks, 5 outdoor basketball courts, 4 softball fields, 10 tennis courts, 3 baseball fields, a tennis hitting wall, an ice arena (Giorgetti Arena), an indoor turf facility, a skateboard park (Flip Side), open outdoor field space, an adult center (Godnick Center) and much more! With a 272-mile footpath, 185 miles of side trails, and approximately 70 back-country campsites (many featuring shelters) offers endless hiking opportunities for the day hiker, weekender and extended backpacker. Enter the trail by crossing the swinging bridge at the Clarendon Gorge-Upper Falls. Located in nearby Proctor, the Wilson Castle boasts 13 fireplaces, 84 stained glass windows, and 32 rooms to explore. The castle is open from May through October with guided historic tours of the 115 acre property. Spend some time with your family and friends for some good old fashioned fun. Enjoy mini golf, batting cages, a small arcade, lawn games and full menu snack bar. Just a couple of minutes up the road from downtown! The Spartan Arena is home to Castleton University men’s and women’s ice hockey programs, as well as countless other events. The arena is open and available to the community for public skating, conferences, birthday parties and more, and features a full fitness center. 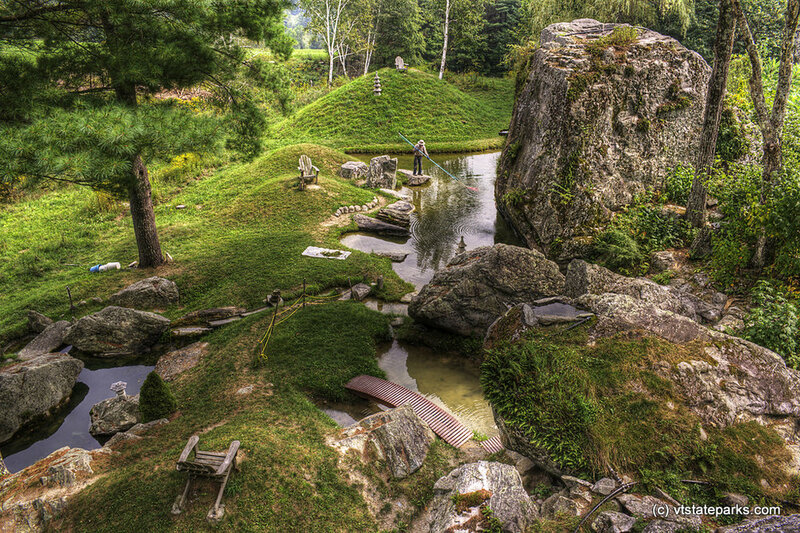 Located in Vermont’s Taconic Mountains, it encompasses over 6 miles of hiking trails, boasting wonderful views of spectacular scenery, and includes an exquisite Japanese garden with ponds, waterfalls, arched bridges, boulders, and viewing spots high above.